It is one of the important bariatric surgeries. 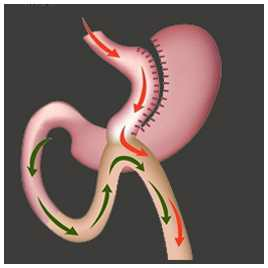 Where part of the stomach is cut off (pocket shape) and gastric bypass is made by passing the first part of the intestine. By decreasing the size of the stomach and bypassing the first portion of the intestine, weight loss occurs by decreasing amount of food eaten by the obese patient. Also decreasing the absorption of food and sugars. It is done by laparoscopy thorough 4 small surgical openings that do not exceed 2cm. Also, Hunger hormone (Ghrelin) is removed in the surgery which makes sense of hunger became rare after the surgery. Who is the best candidate for Gastric Bypass surgery? -The best candidate is the obese patient who likes eating large amounts of sweets and sugary food. -A Patient who has an increase in weight than the ideal more than 30 kg or BMI (weight/(length in meter)2) more than 40 or 35 in the presence of chronic diseases as diabetes, increase in blood pressure or bones diseases. What is the benefits of laparoscopy in Gastric Bypass surgery? 1-Less pain than open surgery. 4-The cosmetic look is much better. How many kilograms will I lose after Gastric Bypass? Laparoscopic Gastric Bypass achieves an excellent degree of weight loss, about 50-70% of excess weight in the first year after surgery. What is after Gastric Bypass? 1-Stay in the hospital for only one day. And return to work after a week at most. 2-Vitamins and protein supplements intake prescribed by the doctor. 3-Continuous follow up with the doctor. 4-Commitment to healthy food and practising exercises to guarantee surgery results. 5-Avoid soda drinks to prevent the probability of stomach stretching. According to patients testimonials who made gastric bypass with DR.Ahmed EL Masry, pain is not mentioned at all especially by using PCA. What should we eat after Gastric Bypass surgery? Fortunately, No deprivation of food at all after bariatric surgeries. The patient can eat all kinds of food but of course in small quantities due to the decrease in stomach size. 1-Suitable for all kinds of obesity and all weights. 2-Stomach size is decreased to about 80% in the surgery, so the patient becomes full after small amounts of food. 3-Suitable for sweet eaters and patients craving for cakes and chocolates.As intestine bypass is made to decrease absorption of nutrients and sweets. 4-Part of stomach responsible for hunger hormone secretion (Ghrelin) is removed in the surgery. Which makes hunger sensation a rare one to the patient. 5-Offers the patient a cure from Diabetes type 2 due to decreasing sweets absorption. 6-Cures the patient from obesity complications as Hypertension and bones diseases. 7- A completely safe surgery. 8- Gives excellent results in the long run. 9- Done by laparoscope which offers the patient a lot of benefits. 10- Achieves a great weight loss compared with other procedures. 11- No foreign body enters the patient. 12- It is from the oldest bariatric surgeries and was experienced for a lot of years. Gastric Bypass. Is it a Redo surgery? Yes, it is. As part of stomach cut from it, is not removed outside the patient body. *Patient submitted to Gastric bypass surgery shows a great weight loss, so the obese patient reaches the ideal weight in very few months and he must follow all doctors instructions regarding diet and vitamins intake especially in the first months following the surgery. *Also the surgery rescues the obese patient from obesity complications as diabetes, high blood pressure, and bone diseases. *Time of surgery is about one hour and the patient stays in the hospital for only one day.